Escape from the neon lights of Las Vegas and enter into the City of Lights at Paris Las Vegas, where guests are transported off the Strip and into France’s romantic capital. Dining, entertainment, nightlife and accommodations at this resort are très magnifique. Paris Las Vegas captures all the intricate details of the real Paris, right down to the cobblestone sidewalks and half-scale replicas of the Eiffel Tower and Arc de Triomphe. Other landmarks that have been duplicated at Paris Las Vegas and can be found throughout the premises are the Louvre, the Paris Opera House and the Hotel de Ville. Plus, the building façades surrounding the casino are modeled after those of actual French neighborhoods. Those who are not afraid of heights won’t want to miss the chance to ride to the top of the Eiffel Tower and enjoy panoramic views of the city. Halfway to the top, the world-class Eiffel Tower Restaurant combines the fine French cuisine of Chef J. Joho with a hint of romance. Mon Ami Gabi, the restaurant that originated the now popular patio dining on the Strip, offers its own charm down on the casino level. Popular chef, DJ and cookbook author Steve Martorano is serving up homestyle Italian cuisine in Martorano’s at Paris. And Hexx Kitchen & Bar features American food favorites 24 hours a day — as well as a bean-to-bar chocolate factory. Guests will forget the casino is close by as they stroll past bubbling fountains and down the winding alleyways of Le Boulevard, filled with charming boutiques and restaurants that resemble Parisian cafes. Le Crêperie cooks up entrée and dessert crêpes while Le Village Buffet offers classic French foods from six different regions of the country in a village atmosphere. Plus, Yong Kang Street is a dumpling and noodle house inspired by the lively restaurant district in Taipei. Looking for some luck — or a way to spend your winnings? Visit Le Burger Brasserie and order their signature dish, a $777 Kobe beef and Maine lobster burger. Topped with caramelized onions, imported Brie, crispy prosciutto and 100-year aged balsamic vinegar, the burger is served with a bottle of Rose Dom Perignon Champagne. You can also enjoy a meal at Gordon Ramsay Steak, run by the fiery “Hell’s Kitchen” star. The City of Lights doesn’t go dull after dark. Chateau Nightclub provides a unique nightlife experience. It features opulent décor and a high-energy dance floor inside with magnificent views of the Strip outside on The Terrace. And there’s plenty of entertainment to experience in the resort’s bars and lounges. Indulge in live music and dancing at Le Cabaret Lounge or Napoleon’s Piano Lounge. Guest rooms at Paris Las Vegas are spacious and beautifully appointed, offering dual-line phones, in-room safes, full-length mirrors, marble bathrooms and more. Let go of that last bit of stress at the Paris Spa by Mandara or catch some rays at the two-acre pool complex. Those who always dreamt of a Paris wedding will want to visit the hotel’s chapels, Chapelle du Paradis or Chapelle du Jardin, and other facilities. 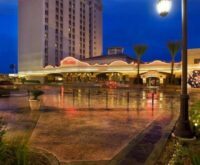 Paris Las Vegas also caters to the business customer, with 140,000 square feet of convention space as well as a business center. All in all, the resort manages to capture not just the heart, but the spirit of Paris itself.